New to this edition are more examples, highlighted and defined key terms, both throughout and at the end of each chapter, and end-of-chapter review exercises. Two new chapters have been added on SQL, along with appendices that include a data model example, sample ERD exercises and SQL lab with solutions. 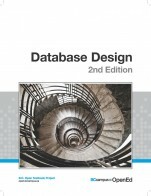 You just viewed Database Design - 2nd Edition. Please take a moment to rate this material. If you know the author of Database Design - 2nd Edition, please help us out by filling out the form below and clicking Send.